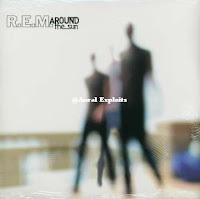 Since I posted my Shades of Grey cover (left), my buddy Brett pointed out its similarity to this REM cover (right). I mean, at least I really love REM! Yes, I think so. I don't know how the various stock houses keep track of these things, but I bet someone said "OK, one sale for a nonfiction book. One to a record label for a rock band. There'll be no overlap here..."
Lovely photo. I'm glad the photog made some money! How does something like the Hootie example happen? Two people with the same stock clip art service?